I somehow missed last week's reports that LimeBike intends to open "scooter lifestyle" stores in major cities where they offer e-scooter sharing ("Lime will open brick-and-mortar scooter ‘lifestyle stores’," TechCrunch) and perhaps in those cities where they intend to launch car share programs ("Lime pursues car sharing in Seattle, breaking new ground for the bike and scooter startup," GeekWire). Note that Segway has stores here and there, including in DC. Often the stores are associated with city tour offerings. Tesla has showrooms in cities and shopping malls with high end demographics. Etc. It reminds me of something I've been writing for years and years. 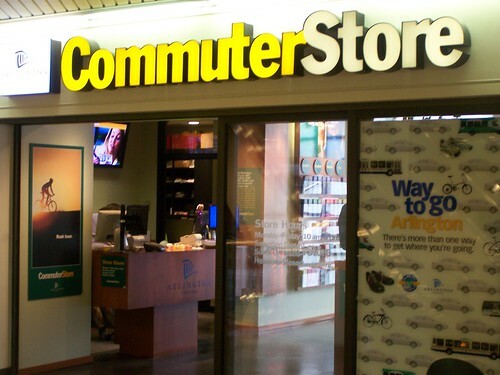 First, in past entries I've suggested that transportation demand management "stores" like Arlington's Commuter Stores, do something like this, be more lifestyle oriented, not strictly transactional. That's because car dealerships were used to sell and promote the automobility lifestyle or motordom, and even though bicycles predate cars, bicycling for transportation needs to be constantly promoted in order to be seen as more than a toy for recreation. Especially given the hundreds of millions of dollars spent on automobile advertising. For example, Ford's new "Built Ford Proud" television commercial, which is part of a multi-million dollar campaign (press release). Thorough, integrated, constant, well-done, and on-going marketing tends to be a missing piece in public programming for transportation demand management. Second, I developed a concept along these lines as part of my brief foray into attempting to sell bike share systems. To differentiate our offering, we included a proposal to put what you might call a "biking" lifestyle and "transportation demand management" store as the front end of the necessary back end repair and operations center. You'd have a repair shop, a cafe, sell bicycles, including cargo bikes, tandems, and e-bikes, but also support metropolitan scale bike tourism and provide information, bike maps, classes and programming, etc. The concept pulled together a variety of best practices. (1) good "transportation demand stores" like Arlington's or Tempe's which is in the city transportation center for bus and light rail, alongside a separately run bike shop and special bike parking facilities. (2) Obviously, good bike shops. But now there are bike cafes in many places, even bike and brewpub operations ("12 Patios Worth the Pedaling," Travel Iowa). Rapha mixes apparel sales and cafe in a concept they call the Rapha Clubhouse, in major cities in the US and Europe, including DC. In DC, the District Hardware bike repair shop (a "store within a store") on the Wharf has a cafe. There is a taco place as part of the Bike Rack shop in Brookland alongside the Metropolitan Branch Trail. There's a two-floor bike shop across from the Museum of London that has repair and cafe on the ground floor, even a place to store bikes while you're in the cafe, with bike sales underground in the basement. Network Rail in the UK has licensed the "Cyclepoint" concept and uses it to brand bike parking centers at train stations. The Cyclepoint in Leeds had a bike store, run by a national firm, but that function eventually shut down. 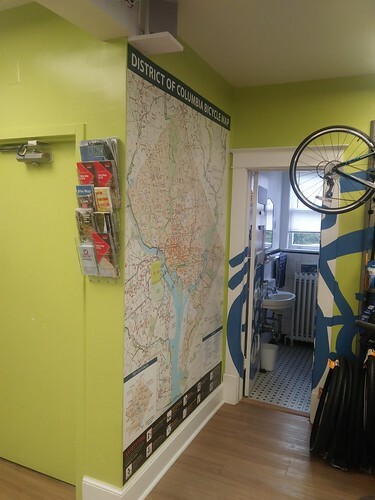 (3) The Race Pace Bicycle Shop in Ellicott City has a dedicated store within a store for women's cycling called Bella Bikes but also has a huge map of the region's bike trails on one wall, along with maps and brochures from many of the area jurisdictions. At least that's the way it was in the original location ("Maryland retailer moves store after extensive remodel," Bicycle Retailer). 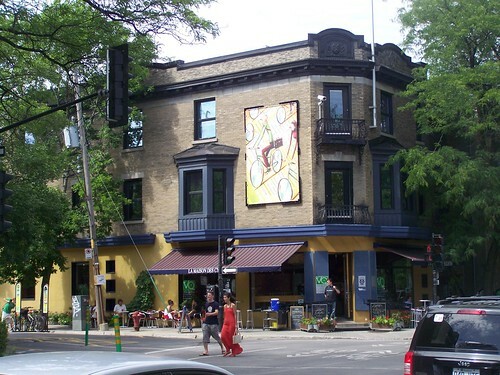 (4) the headquarters for VeloQuebec, the bicycle advocacy group for the Province of Quebec. 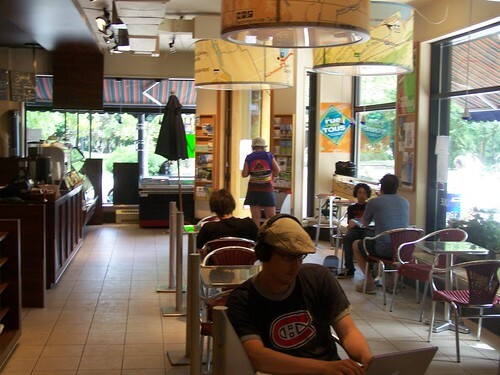 It's located on a highly used cycletrack in the City of Montreal, across from Parc La Fontaine. The VeloQuebec store has a cafe and a travel agency--they sell a lot of bike touring packages, a little bookstore too, which also sells their publication. But the "House of Bicycles" doesn't offer bike repair. 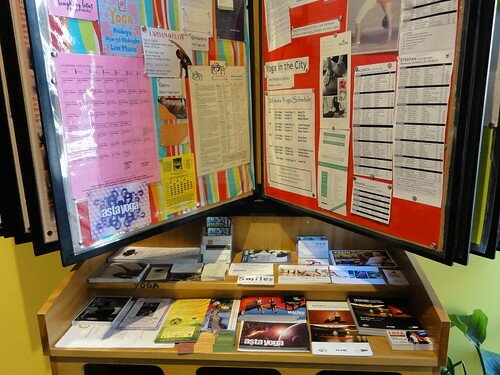 (5) the way that Lululemon originally made their yoga apparel stores as centers for the yoga community, promoting independent yoga instructors, having a community information board in the stores ("Lifestyle for sale at Lululemon," Washington Times). (6). Adidas Runbase stores are shoe stores that have locker rooms, showers, etc., and serve as an anchor for the local running community. ("Boston Marathon Runbase opens on Boylston Street," Competitor). The first Runbase was in Tokyo. Apparently, "running station" type stores are big there and Adidas was not the first ("City of Fleet Feet"). And the now closed running shoe store on Falls Road in Baltimore County was very supportive of extending the Jones Falls Trail into the county, arguing that runners were avid use of trails also. (7) Turns out, along the same lines, Goodyear Tire has come up with a new concept called Roll, targeting younger demographics, offering a better experience for buying/replacing tires. The stores sell tires but installation is off-site. They are being piloted in the DC area, including in Bethesda Row in Montgomery County ("How the Innovative Roll By Goodyear Pilot Program Works," Modern Tire Dealer). The stores are located in lifestyle shopping districts, rather than the more traditional service shops designed as repair garages, semi-industrial, and not necessarily located in highly visible places. More bike shops are doing a better job of including maps and brochures, but often the information is inadequately displayed. 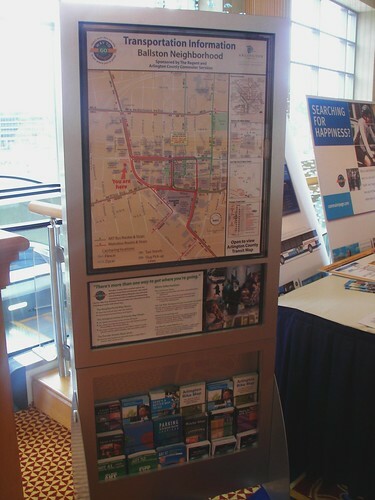 That's why more recently I've had the idea that area transportation demand management programs should create model bike commuting information kiosks for bike and recreational stores, using the Arlington transportation information kiosk as a model. 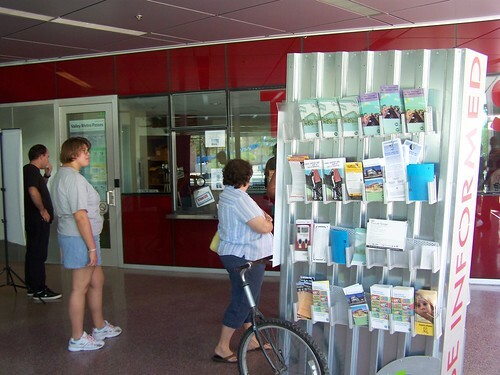 Maps and informative brochures are displayed on a back wall of the Takoma Bicycles store in Takoma Park, Maryland in a manner that makes the information less accessible. 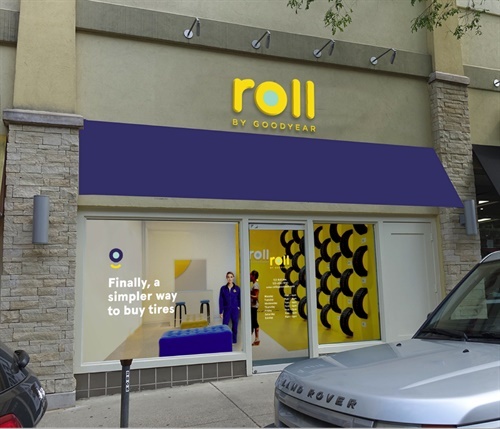 Turns out, along the same lines, Goodyear Tire has come up with a new concept called Roll, targeting younger demographics, offering a better experience for buying/replacing tires. It is a good example of where the private sector is willing to allocate million here (in marketing expenses) and the public sector does zero. Potential good use of a PPP -- because stuff like this is what gets people upset about government budgets. And honestly I did use the commuter store twice -- both times to buy metro cars before they introduced kioks. And again Uber is tiring to do this -- be the "Amazon of mobility" offering a one stop shop for everything. You'd be a good hire! And all comes back to your point on the "transit" city -- and I'd say that is all back to budgets. What you want is money flowing into one pot that is controlled by the "mobility commission" that doles it out and thinks about mobility and creating a transit city. So 12 years ago I wrote that piece about "action planning" and how great Arlington was because of the Commuter Store and the Car Free Diet (and with Tower Hamlets and the Idea Store and Baltimore and the Live Baltimore recruitment program), but other than the mobile vehicles they haven't advanced the concept much over the intervening 12 years. But it influenced me. So did Cablevision's acquisition of The Wiz stores and their setting them up to sell cable. I don't think they kept with it but it helped lay the groundwork for all those wireless stores. and other types of lifestyle stores. 2. Anyway, I have been thinking a lot of what you wrote about Uber and logistics, starting back awhile ago, not just recently, and how I piped back about brand recognition and platform. I do think you're right. Uber is a brand and a platform and has great recognition. What they've been able to do is set "commission fees" per transaction that are much higher than what used to be customary. I am not super knowledgeable about the business models of various types of businesses, but to me, it seems that Uber's commission rate of 25% to 35% is wonderful for them, but terrible for the proprietors, it basically skims off all the profit margin from the transaction, although there are certain types of ways of doing it that it can make sense (e.g., UberEats is great for a restaurant Sun-Thurs. and hard to handle on Friday and Saturday). Uber will live because of that first mover advantage. I don't know which particular line of business they'll make out with though. scooters don't have much legs. Eventually venture capitalists will tire of subsidizing rides. It'll be a long time before they can take people around in AVs. 3. another piece I have to write about the Lyft and Uber 'subscriptions', another thing I missed last week. 4. 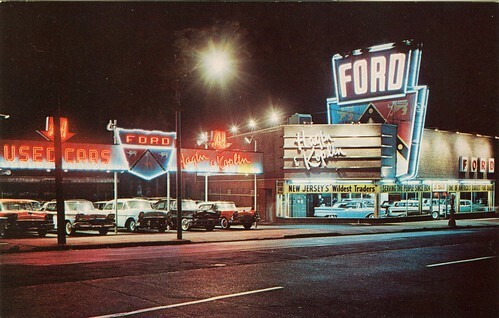 Anyway, in my presentations on bike planning I make the point that it took about 60 years to build the system of automobility from gas stations and dealerships and maps to restaurants, signage systems, road systems, hotels, etc. (counter with that graphic from the German bike plan about biking). Sustainable mobility needs that kind of marketing. But wtf to call it? Sustainable mobility. Smart mobility. Walkability. Placemaking. Nonmotorized Transportation only covers walking and biking. Livability. in the Walkable City Rules book he quotes the former mayor of Portland talking about streetcar as a "pedestrian accelerator"
the Riide people have a great line, even if I disagree, about how e-biking "flattens the city." I mentioned in an entry a couple weeks ago about how as the city adds population, more amenities are provided at a more local scale, which reduces "the need to use transit" at least Metrorail and likely this is an issue in the ridership decline (along with s* service and reduced frequency). The relatively long distances between Metrorail stations makes it less efficient outside of work trips. So yes, transit and sustainable mobility needs great marketing and the govt. types generally aren't good at that. Arlington is better than most -- godcgo is run by Arlington -- but more still needs to be done. They need a reboot too, probably, but I haven't kept up with what they've been doing and in any case, they are far ahead of the otehr jurisdictions. I didn't write about WMATA's presence at H St. Festival. They don't have able enough people as outreach workers. They need really good people. Getaround was there (but not Zipcar or Car2Go like years past). Streetcar was there, but by focusing on spinning the wheel, they're not likely to have substantive contact. You've probably seen Free2Move vehicles around. It's owned by Peugeot. I looked at their website for jobs and asked Suzanne if she is up for living in Berlin... she doesn't think it will work well for her parents! I didn't know but Autolib shutdown in Paris. Have to track down why. As a "lifestyle" store you need to reference Apple and also Xfinity, which has really moved in that direction in the last two years. The best corporate role for you would be evangelist. But that requires toeing the party line! (Which you may or may be able to do). Also requires coming up with catchy phrases so people can grab it. Ideally it would be something like "Director of Mobility Partnership": thinking about how to do this from the public side and finding ways to leverage these entities to do something in the public's interest. You use Arlington as an example but I'd say Arlington is old school -- just using density around heavy rail. The real thing is how to create density outside of heavy rail (i.e. you H st example) although in reality I think that was as much NOMA station as the streetcar. But if you look at DC I wonder if you see a property jump inside the L'Enfant because you can every easily bike/walk/scoot/uber/car2go/whatever to work and how to use that to bring up property values. I'd say to counter to H St the rise of shaw is basically that story -- close in becomes even more valuable as non-car options abound. thanks for the career advice. 2. Very good point about Arlington. 3. And NoMA. I've argued that the infill transit station was the most important public investment concerning H St. People would argue with me, saying I don't understand geography. I explained that it changed people with choices willingness to live north of H Street, completely changing the demographics and attitudes. In fact, witnessing that process and its impact on H Street is what decidedly shifted me towards transportation planning. I'd already been interested. But it was the denouement. My lesson is that when done right, public investment in transportation infrastructure, in particular sustainable mobility infrastructure, has extranormal positive impact on neighborhood revitalization, faster ROI, and greater ROI compared to other public investments (cf. "Opportunity Zones"). Another type of initiative with a huge ROI is the "10 year property tax abatement" on new housing in cities like Philadephia. Arguably, they can now dial it back, with higher abatements in less popular areas, and now lower abatements in already successful areas. But it was huge in terms of attracting new residents. 4. wrt L'Enfant, I'd say yes. But it's actually the same story as Shaw. In both cases, at the time of the main Metrorail network development, they were outlier neighborhoods. As the more preferred neighborhoods were built out and conquered by new residents, it's the one over neighborhood phenomenon. But with L'Enfant too, and by that we include SW-Waterfront Metrorail, it was the reconstruction of what had been urban renewal terrible stuff. It's multiunit and office still, but much more livable, with emphasis on street experience and vitality. Not on tower in the park and hulking buildings. And yes in other way, this phenomenon we've been discussing that I don't have a pithy phrase for, where so much more in your "mobility shed" is able to be accomplished sustainably, and not even using Metrorail. another term is from ICLEI, "ecomobility"